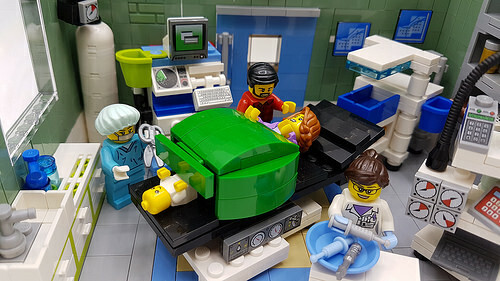 Angela Chung has made great use of the new baby minifig in an excellent hospital scene depicting the arrival of a new baby. Sometimes “obvious parts usage” makes for the best models. The details of the delivery room surrounding the central action are nicely done with a variety of mobile medical machinery at the ready. I particularly like the incubator trolley with it’s little heat lamp waiting to keep the new arrival cosy. However, close attention to the scene does raise one troubling question…what is the screwdriver for? Regardless, this is a lovely model, and is all the more refreshing for depicting the sort of real-life events we don’t often see “in the brick”.